Fall Break Camp Elementary Tours - Tuttle Orchards Inc: Indianapolis Apple Orchard, Pumpkin Patch and Farm Store. Minimum 15 participants to book tour. Tour Length: Allow 1 hour. This tour is designed for elementary students not preschool groups. 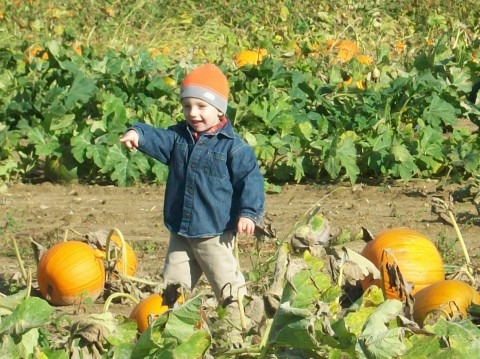 Tuttles offers both apple picking and pumpkin patch field trip experience in one location. Time in orchard picking a small bag of apples. Hayride to the pumpkin patch to pick a small pie pumpkin. Age appropriate lesson about apples. Fun in the Tractor Town Kids Area. Picnic area available for hour immediately following tour with reservations (not available before tour). Approximately 1 hour of guided activities + play time. *One teacher free per every 15 students. All other adults/sibling to participate in tour are regular price. Infants who have not yet had their second birthday are free, but will not receive any apples or pumpkin and are expected to sit on laps if needed on the hayride. Don’t have fifteen people for a group? You can choose to pay the $105.00 minimum for a group tour or choose to participate in our general public upick and farm activities which are also open on weekday hours. Information and pricing for general public. Weather: Weather in September and October is normally great for a visit to the orchard. However, in the event of rain the morning of your tour, we will contact you to reschedule your tour for a better time. Tours are only rescheduled if it actively raining the morning of the tour. Because of the unpredictability of Indiana weather, we don’t reschedule tours in advance of the morning of your tour. Cancellation: We often have a waiting list for field trips. If you are unable to keep your scheduled time, we ask that you cancel at least one week in advance to allow another group to take your place. If you fail to cancel and do not show for your tour, we will charge a no show fee of $50. Weather related cancellations do not apply.